WOODBRIDGE, Va. -- Ahead of President Trump's Tuesday announcement where he is expected to terminate the Deferred Action on Childhood Arrivals (DACA) program, a group of young, undocumented immigrants are trying to rally support and convince others why they should be allowed to stay in the United States. 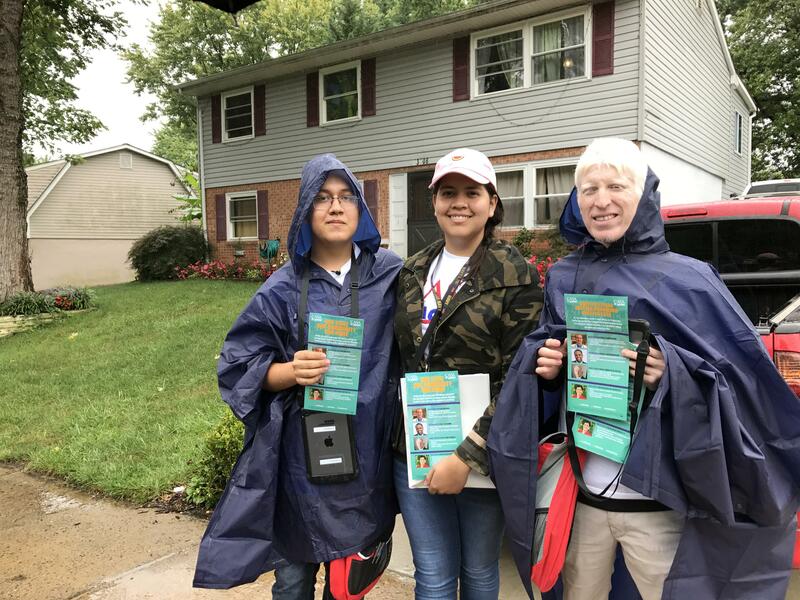 Siblings Angel, 19, and Jennifer Romero, 20, went door-to-door in the pouring Virginia rain Saturday in order to advocate for DACA, the 2012 executive order penned by the Obama Administration that deferred deportation for two years and granted options for higher education and work permits to undocumented young people in the U.S.
Now five years after DACA's rollout, the fate of both the program and undocumented families rests with President Trump's determination of whether DACA should be renewed, relinquished to Congress for a possible permanent legislative fix, or repealed altogether. The worst option, according to the Romeros, would be any diminishment of DACA. This possibility has motivated the Romeros and their fellow canvassers at CASA In Action, an organization that advocates for pro-immigrant policies and politicians, to trek through their neighborhoods and to advocate on behalf of the almost 800,000 "Dreamers" who were brought into the U.S. illegally as children by their parents. CBS News went along with the Romeros, who came into the U.S. as toddlers from Mexico, and their canvassing companion, Francisco Lasso, 25, originally from Ecuador, as they all rung doorbells and rapped doors to remind their fellow Virginians to vote in the upcoming elections. While this is their job, the Romeros and Lasso told CBS News the impending decision has created a sense of urgency and has recently motivated them and several other Dreamers to knock on an estimated 10,000 doors. "As a DACA recipient, I can't vote but this is my vote per se," Angel told CBS News. "Going out to canvass, knocking on doors, it is kind of my way of informing people who can vote," he said. Jennifer said that a DACA dismissal would mean that all three of the DACA canvassers would lose their jobs. Lasso told CBS News that his online university studies, which he called "the best opportunity," would cease alongside the DACA program. When asked last week if young people like this small group should be worried, the president said, "We love the Dreamers. We love everybody," and later added, "I think the Dreamers are terrific." What happens to "Dreamers" if Trump rolls back DACA? CBS News asked the Romeros and Lasso what they would say to the president before his ultimate decision. "Mr. Trump, you've said you have a heart, you say you are going to treat this [decision] with heart, this is a chance to share your heart. Prove you have a heart and that you do care," Angel said. For Jennifer and Lasso, they said that they would tell the president that their aim is to contribute to this country. Jennifer said she wants to join the military -- specifically, the Marines -- and then jumpstart a career as a teacher. "We are not breaking any rules. We are not doing anything bad," Lasso asserted. "We are just trying to find our voice and make a better life in this country." These canvassers' calls have been echoed across the political spectrum from the U.S. Conference of Mayors to House Speaker Paul Ryan. Angel said he recognizes that the DACA executive order was a temporary solution to a problem that could plague his whole life. He said he is encouraged by the outpouring of support on Capitol Hill but he hopes that the president will see what he does: his American values. Soaking wet from an afternoon of door knocking, Angel avowed, "I am an American in every way except for on a piece of paper." The Romeros and Lasso said that they plan to travel to the front of the White House on Tuesday before Mr. Trump makes his expected final DACA decision. Until then, these Dreamers said they will continue to knock on doors -- rain or shine.